Year 7 student, Cathy Shipway is now a published artist, with her digital artwork (shown below) being published in the Toitoi magazine recently. The four illustrations were some of the first “100% digital” art that Cathy created, using a simple drawing tablet that her family had given her for Christmas. This was also the first time that the Toitoi magazine had a contributor submit digitally painted artworks. Cathy used the Firealpaca free drawing software and learned digital drawing techniques by studying videos on Youtube from other Internet artists. Baverstock Oaks Primary teacher, Mr. Gibbs recognised Cathy’s artistic talents and submitted a selection of her work to learn whether she would be eligible to illustrate one of the stories for the Toitoi magazine. Cathy was thrilled to learn that she had been accepted as an illustrator for the publication. 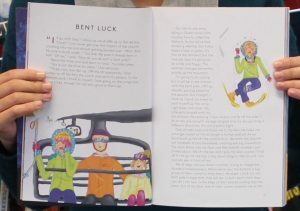 ‘Bent Luck’ is story about a disastrous skiing trip in Queenstown, where a bent ski pole signals the start to a series of challenging experiences on the slopes. This story was a particularly good match for Cathy, as the previous winter her family had visited the ski fields in the story and had taken a ride on the chairlift – so Cathy had already seen and experienced the subject matter herself. Cathy admits that at first she had intended to use watercolours, however after further consideration she decided to use her digital tablet to produce the four art works. First Cathy sketched the picture concepts, then blocked in the colours on the sketches. Next, she refined the painting and added highlights and details. 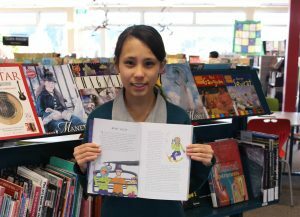 Cathy has found this to be a GREAT experience and next time hopes to be a published author-illustrator!